I started with a simple Idea. So, I took out my fashion design book for the first time in a long time, and I started sketching ideas. Before long, I had come up with an elegant but messy peacock costume with a corset top and a high low layered skirt. Before this costume, I had only ever created outfits using patterns, so I wasn’t too sure how this one would go. All in all, I was impressed with my results! I began my costume by going to Fabricland while things were on sale, and buying a ridiculous amount of black fabric. I then took it home and free-hand cut it to my measurements. I ordered feathers off of various online sites including peacock feather ribbon. I added this ribbon onto the edges of each skirt layer. It took me a very, very long time to figure out how I was going to attach each of the layers together. In the end, I decided to add a zipper to the bottom 2 layers and have the top one hid the zipper. This turned out surprisingly well. With all my feathers, a corset, boots, headpiece, and gloves in, the only things left to do was decorate everything with feathers. All I used was a glue gun for this, and then I added fluffy ostrich feathers to the bottom to hide the glue. The final touch on the day of the photo shoot, was the makeup. I had done a trial run the day before and did not like how soft it turned out. So, on the day of, I decided to go with something a little darker and messier. 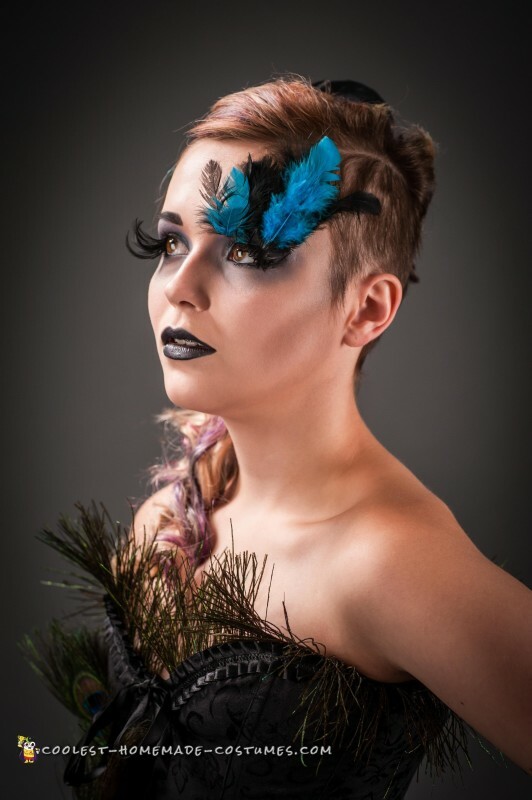 The original look was done with face paint and gems.. the second time, all I did was eye shadow and eyeliner as well as only one eyebrow had feathers. On the day of the photo shoot, I spent about 3 hours on my hair and makeup and getting dressed. When I went to meet Bob (the photographer) outside, my heel broke. This is what you get for using heels that only cost you $10.00 I suppose. When we got to the studio, the first thing we did was take out a glue gun and attempted to glue the heel back on to my boot. This method only added about 10mins of shooting to the lifespan of my poor peacock decorated boots. So, basically for the whole shoot, it was just placed there and I had to balance on one foot! Although the costume decided not to cooperate with me in that sense, the photos turned out spectacular. And, we could not be happier with the finished product. I am so excited to share my costume with you all, and I hope you enjoy the final product.